Our two buildings, painted cream color with aqua stripes, are right beside the McGrath/O'Brien Highway in Somerville, across from Twin Cities Plaza. Ample, free visitor parking is available along Joy/Chestnut Street and Linwood Streets. Note that there is no visitor parking on Fitchburg St, in the small lot at the corner of Fitchburg and Chestnut, or adjacent to the Brickbottom buildings. 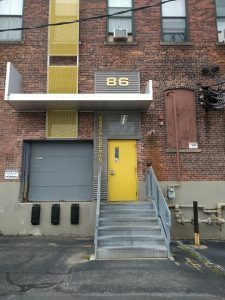 Our neighbors at Joy Street Studios are located one long block up Chestnut St. from Brickbottom (Chestnut and Joy are the same street – the the name changes where Poplar intersects). Visitor parking is along Joy/Chestnut Street. Green Line to Lechmere Station: we're a 10-minute walk, or take the 80, 87, 0r 88 bus from Lechmere three stops to Poplar St & McGrath. 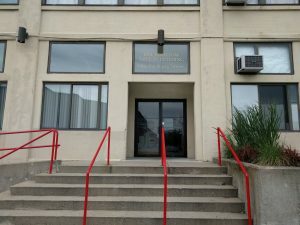 Walk 2 blocks to the end of Poplar; Joy St Studios is across Chestnut (main entrance to your left); Brickbottom is at the end of the block to your right. Orange Line to Sullivan Square: transfer to bus 86 or 91, and get off at Washington St & Medford St (the stop is under the McGrath). Cross Washington St to AutoZone and walk down Joy St. Joy St studios is on Joy at Poplar (about 1/8 mi); Joy St becomes Chestnut; walk one more block to Brickbottom's front door. : Ride inbound (toward Sullivan Station) to Joy Street; Joy St studios is on Joy at Poplar (about 1/8 mi); Joy St becomes Chestnut; walk one more block to Brickbottom's front door. By Bus Routes 80, 87, 88: Ride inbound (toward Lechmere) to McGrath Highway and Medford Street (Glass Stop/Hub Glass). Cross under McGrath Hwy to Poplar Street. Walk 2 blocks to the end of Poplar; Joy St Studios will be across Chestnut to your left; Brickbottom is at the end of the block to your right. Brickbottom main entrance, on Fitchburg Street at the end of Chestnut St. Entrance to Joy Street Studios, 86 Joy St, near intersection of Poplar St.